Well I totally forgot yesterday, I was really in the crafting groove plus I had a last minute card a friend asked me to make for her so was wrapped up in getting that sorted and then it got late so I just went to bed and completely forgot about blogging! Anyway I am here today and have a pretty little something to share with you! Today's been a busy day at work, glad to be home now. I'm going shopping with my friend Ally. We haven't hung out in ages so it'll be really great to see here again, get some dinner and mooch around the shops! I seriously need some work clothes! I don't have many suitable clothes so I think that's a very good excuse to shop! I know I have a major peeve about cards with things on a wonk, I am really trying to get over this peeve and actually found this card working better with the sentiment working on an angle in conjunction with the mini clothes peg. I've been really wanting to do more sewn cards and as I had free time on Monday I thought it'd be a good chance to whip the sewing machine out and do this card. I just placed the vellum over the top and sewed it almost all the way, posted the "confetti" through the gap then sewed it up the rest of the way. I've got to admit I really like the frosted confetti floating around. 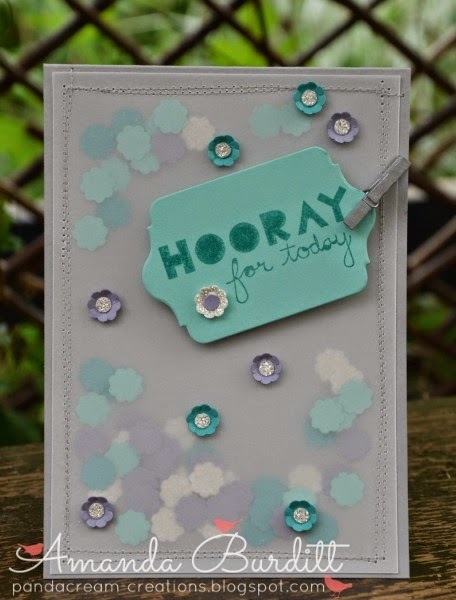 A few little confetti pieces placed over the top just lift the card and bring little pops of colour to card. I really like the sparkly dots of glimmer paper in the centre as a change from rhinestones or pearls. Do you ever sew on cards? I'm actually amazed at how easy it is - the machine seems to take to the paper really well and its such a fun look. Also, its a pretty cheap way of jazzing up a card. I'm off for my evening out now, catch you again tomorrow with something else new! Have a lovely evening too!